You are not currently logged in. If you are a guest to our site, Welcome! There are advantages to Free Registration, and we also offer a Premium Access level. Create a Portfolio of the symbols you own or the ones you want to watch. In the process, you can define the columns you want to watch, not necessarily the ones we show on all the standard pages. Create Alerts for your portfolio that will email you when a price level is broken - going up or going down. Flag your Favorite Screens for easy access from the My Pages menu tab. You may also want to consider our Premium Access. What are the advantages of Premium Access? More data for backtesting - Our free service offers 5 years of data for backtesting while our Premium Access users get 10+ years worth, going back to 2001 when there were less than 100 ETFs traded. Standard screener results reflect averages from multiple cycles. With Premium Access you can review each cycle independently and even see trade-by-trade results. Additional rebalancing periods for backtesting - While our free service offers backtests based on weekly, 2-week, monthly, and quarterly periods, our Premium Access users can also backtest for 1 and 3-day periods. More options for our Trend Explorer model - This model takes advantage of our unique database to screen for trends across a population of ETFs. Our free users get the usual 5-years of data and utilitze SPY as the traded fund. Premium Access users get the full 10+ years of data and can select any fund as the trade vehicle. Historical Data - This data is available for portfolios, screens, and many of the other pages throughout the site. This allows you to view what your portfolio or other view would have looked like up to 2 years prior. 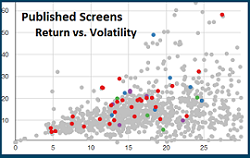 Ever wonder what a screen was picking just before the last market tumble? Now you can know. In-Page Charts - You can access these quick pop-up price charts available throughout the site by clicking the button. This makes quick work of keeping up to date on your portfolio or checking the symbols in your favorite screen. This is a real time-saver and allows you to stay focused on the bigger picture. Other site enhancements - These extras are a bonus. You can select your price charts to default to the common static variety or the interactive charts, or define a personalized link for easy navigation from our chart page to the chart or information page of your choice. Find yourself going from ETFScreen to Stockcharts or ETFScreen to Morningstar? Define a personal link, and you have one click access to the other site. You can even go directly to your trading site in some cases. Support the Site - What can we say? Subscribing is a great way to show your support for the site. Subscribe and show your support today! and return here for Premium Access. The financial portions of this transaction are handled by FastSpring as a reseller for ETFScreen.com LLC. Why? Because FastSpring brings professional management to handling online transactions, and we care about the security of your financial data - and of ours. Can I Cancel? Yes, anytime. Subscription payments are not refundable; however, you can cancel anytime, and there will be no more charges. In the meantime, you will have full access until your pre-paid term expires. How do I Cancel? Log-in, and then from the My Pages link on the navigation menu click My Account. From there, find the Premium Access area and click Cancel. It's easy! How do I Change my Payment Information? Like above, go to the My Account page and click Modify Subscription.